“Mine, Mine, Mine” is Daffy at his greediest. Directed by Chuck Jones in 1957, Daffy & Bugs outwit Hassan for the treasure. 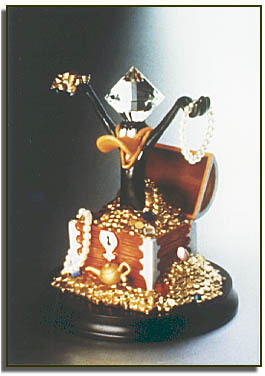 This sculpture is enhanced with a lead crystal gem on Daffy’s head. Goebel, among the most renowned companies producing collectibles for over 125 years, has teamed with Warner Bros. to create classic moments from America’s favorite cartoon shorts in fine porcelain.